I spent most of my life in law enforcement. After I retired I started my own business in computer repair, satellite TV and appliance repair. Growing up on a farm, I knew a lot about raising crops but we grew crops to eat or sell, so flowers were not part of the process. My grandmother, however, always had flowers around her home and in her later years grew many daylilies and even hybridized them. About 15 years ago my sister, Bobbie Ann, and her husband, Stan, decided to retire from Massachusetts and move back to Louisiana. She wanted to grow Louisiana Irises. They purchased 21 acres on historic Caddo Lake in Caddo Parish, Mooringsport, NW Louisiana, and we turned several acres into iris beds. It was hard work preparing all the beds, digging up thousands of irises from a defunct nursery in Garland, TX, and moving them to LA. But the first time they all bloomed I became a “flower nut”. About 13 years ago my wife Sue and I sold our home in a nearby village and built a home on the nursery property. Living at the end of the road means no cable TV, not fast internet service, electrical service that fails during heavy winds and a long drive for groceries. Nevertheless, the advantages far outweigh the disadvantages. Living on a commercial nursery where we grow thousands of Louisiana irises, 450 varieties of daylilies, many fruit trees and lots of wild flowers makes for a bit of heaven right here on earth. During April I can sit on my front porch and view hundreds of irises and many fruit trees in bloom. 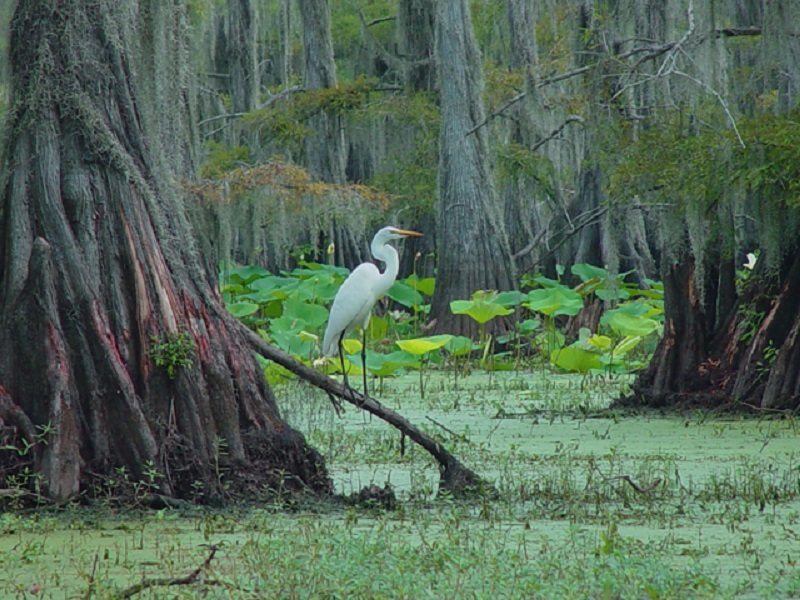 Caddo Lake, a water fowl refuge and natural lake in NW LA. I wrote this post to share some of the pictures of this beautiful place. 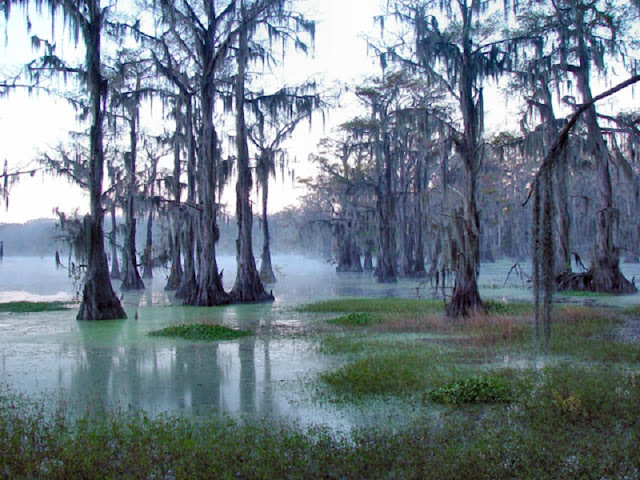 Caddo Lake is a remarkable result of nature. The bald cypress trees and Spanish moss are not only hauntingly lovely but they are also amazing because of their ability to live in the water and produce cypress knees. This area of the property is near the “rock pond”. These large sand stone rocks are often dug up at various locations around the property, especially when trying to dig a bed for irises. I tried to dig the large rock in the middle of the pond but could not move it with the backhoe. So, I just dug out a pond around it. Stan has now created a new water feature in this area and I’ll have to take a more recent picture this spring. I hope you enjoyed the pictures from the end of the road. If you are interested in knowing more about Louisiana irises, you can learn more at the Society for Louisiana Irises web site. Amazing location, Ron. Hope we can visit for the 2018 Convention and enjoy it in person. Thank you for the details on this post. Thank you for the beautiful photographs of Caddo Lake. I would love to come see it in person!